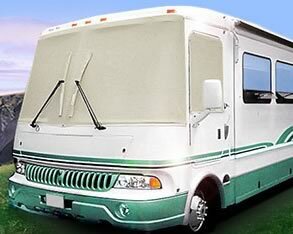 Sunguard - Americas first choice in quality Recreational Vehicle Windshield Covers! A Sunguard cover will block up to 94% of the suns heat, light and damaging UV rays that enter your motorhome. They protect your dash, front seats, interior walls, counters, upholstery, and curtains. They dramatically lower the temperature inside your motor home by as much as 40 degrees. They eliminate glare on your TV screen and allow you to view the movie, not the suns reflection! At the same time, during the day, you will see out, but neighbors wont see in! Cool your interior as much as 40 deg. Dont let the suns unmerciful UV-rays destroy your dash, front seats curtains! Order your Sunguard Windshield Covers today & block out up to 94% of the heat, light & damaging UV-rays! Block the sun keep your view! OUR MOST POPULAR - Hi-Density 94% Sunscreen. 42 x 12 weaves per square inch mildew resistant. Our snaps are made of genuine STAINLESS STEEL, and are not simply chrome plated like ordinary shades are, so they wont rust or corrode! Theyre almost invisible. Our most popular and barely visible Snap provide "snap-on" convenience. Simply screw them into place with a phillips screwdriver. Only their small shiny heads remain visible. Twist & - and forget em. Twist-Locks mount to your rig with stainless steel screws. Their quartet-twist locking heads hold Sunguards Windshield Covers firmly into place. For customers who dont want to drill into their coach, we can outfit Sunguards with 2-inch square adhesive Velcro type patches. They stick firmly into place and have the advantage of being removable at any time without a trace by saturating them witha WD-40 type spray. For extreme sun filtering, upgrade to our 94% Hi-Density,... its Sunguard best sunscreen! It provides better privacy, more efficient sunscreening, and greater heat-gain reduction. It also lays flatter, looks nicer, and is easier to install more wrinkle-free! Most of our customers prefer the Hi-Density Sunscreen. A rugged and durable 16 oz. per square yard, the sunscreen is made of 100% vinyl-coated polyester, woven at 42 x 12 weaves per square inch and is mildew resistant.